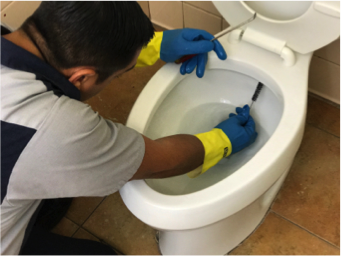 Every week, Hygenex’s Hygiene Technician performs a thorough, proprietary process for detailing all porcelain fixtures fixtures – including under the rims of toilets, under urinals, and under sinks; these are the areas that janitorial service or in-house cleaning crews will NEVER hit. It is a procedure designed to eliminate any unsightly and unsanitary buildup of uric acid, mold, mildew, fungi, and related contaminants. We match our procedures with a clinically proven, long lasting germicide to ensure that all of you bowls, sinks, and urinals are free from potentially dangerous pathogens. We then include and service free soap, air freshener and free urinal screens. We use an acid solution and manually scrape and scale to get rid of the mold, mildew, uric acid… all the things that cause odors in the restroom. We apply a germicide solution to take care of potentially harmful pathogens. Not to cover up odors, because we will take care of them from where they come from, but our continually operating, Industrial battery powered fan driven air freshener leaves your restrooms smelling fresh twenty four hours a day, seven days a week. Not only will you not ever have to buy soap again, but you wont have to inventory, stock, or worry about pilferage. Our Hygenex soap is fresh, appealing and is sure to enhance your employees and customers hand washing experience. Another item that you will never have to worry about again! Our deodorizes and sanitized urinal screens help to leave your restrooms smelling fresh. Our Sanitized By Hygenex Sticker are places on each fixture let your customers and employees know that you’ve gone the extra step for their protections.